As you all know, Gaming is a popular and interactive entertainment industry in the current scenario. These WordPress themes are designed keeping in mind the needs of gaming enthusiasts and companies to help them setup their own website. I have handpicked only the best Gaming WordPress themes from plenty of themes available in the market. 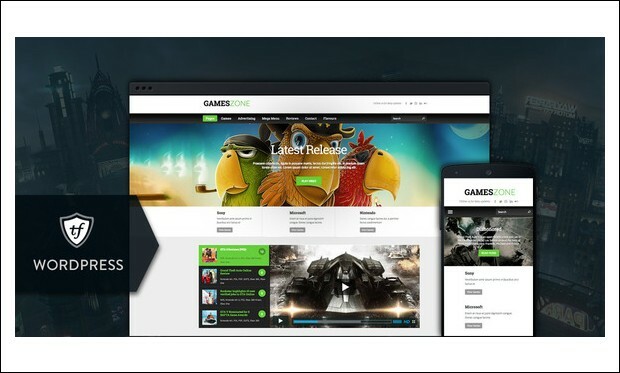 Choose the right theme for creating gaming portal, gaming reviews, gaming news and games eCommerce websites. 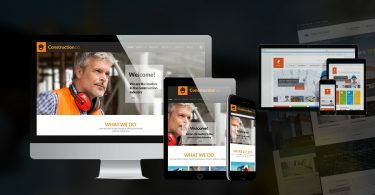 All these responsive themes perfectly adjust on different screen sized devices such as iPhone, iPad, smartphones, tablets, android, laptop and desktop computer. Users can write amazing reviews to the latest released video games with the help of these WordPress themes. Many of these themes feature bbPress and BuddyPress integration to transform your site into a community portal. 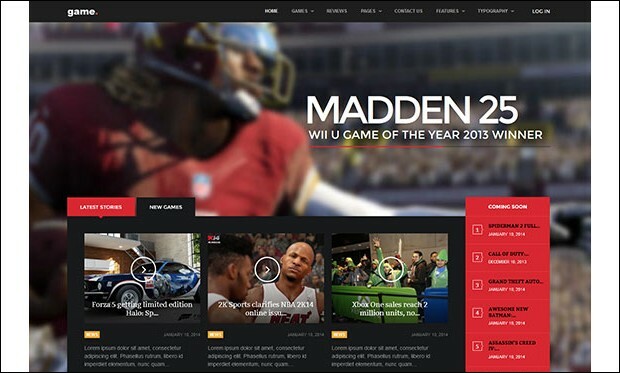 Now, check out these 35 Best Responsive Gaming WordPress Themes. 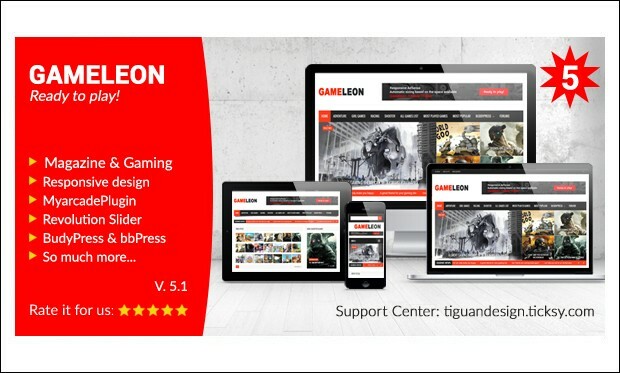 Gameleon is the perfect gaming wordpress theme for online games, arcade games or any other gaming site. It is fully featured with all the powerful features useful in creation of the powerful and customizable gaming websites. Ithaca is the powerful and flexible wordpress theme for the creation of the online gaming site or game blogs or gaming portals. It is feature packed with all the gaming features that help in creating the gaming websites. 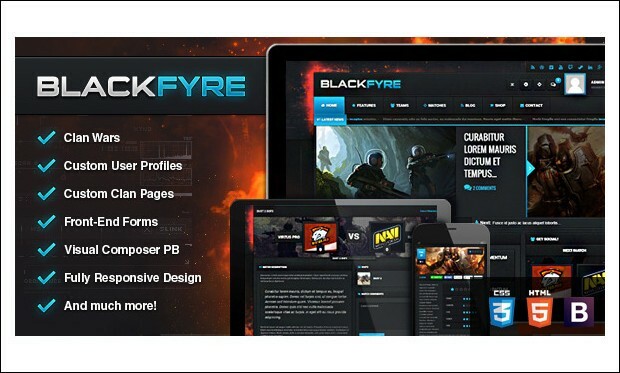 Blackfyre is the flexible and powerful wordpress theme that helps in creating the massive gaming website. It has many awesome features with which users can create the clans and challenge each other in a community. 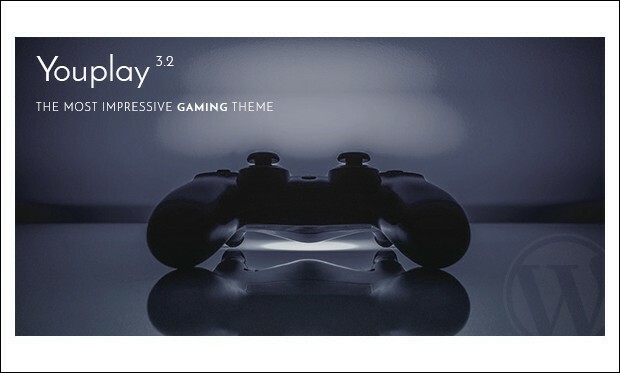 Youplay is the creative and impressive gaming theme for gaming, communities, clans, news and store. It is clean and responsive with all the impressive features that help in creating the interactive gaming website or gaming community. 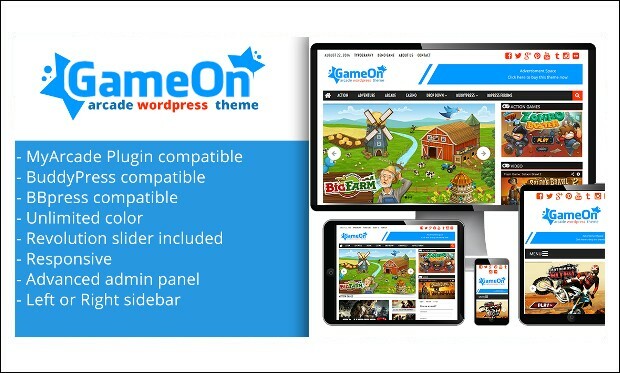 Gameon is the premium and flexible wordpress theme for creating the gaming portal and website. It looks and functions perfectly on desktop computers and mobile devices. It is featured to create your own gaming website and impress the online players. 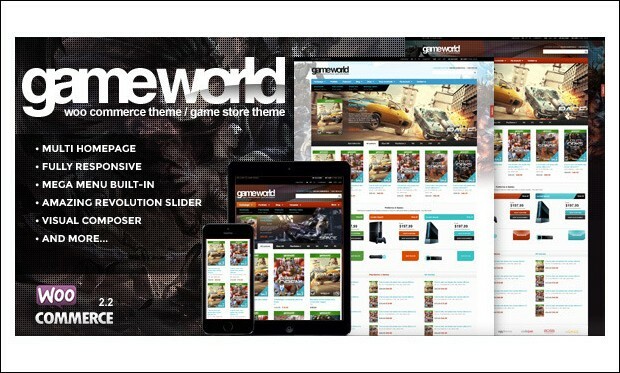 GameWorld is the clean WooCommerce game theme that helps in creating the perfect gaming website and premium eCommerce Game Theme. It has many features which are packed in the theme to easily create the website dynamically. 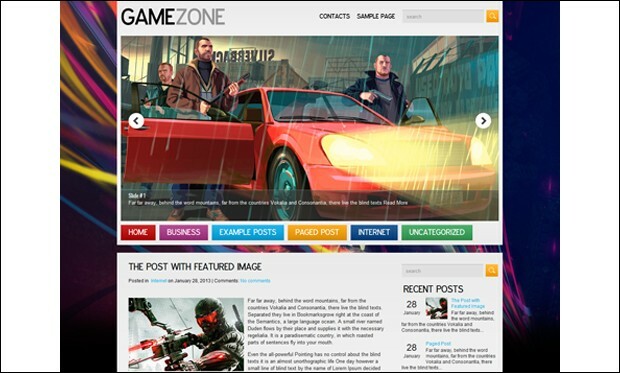 Games Zone is a responsive and retina ready WordPress theme mainly designed for creating gaming blog and magazine websites with ease. By using colour picker, you can change colours of various elements of the theme in a single click. You can keep your visitors up-to-date with the latest or recurring events via built-in events calendar. It is advertising ready to help you generate money from standard banners. 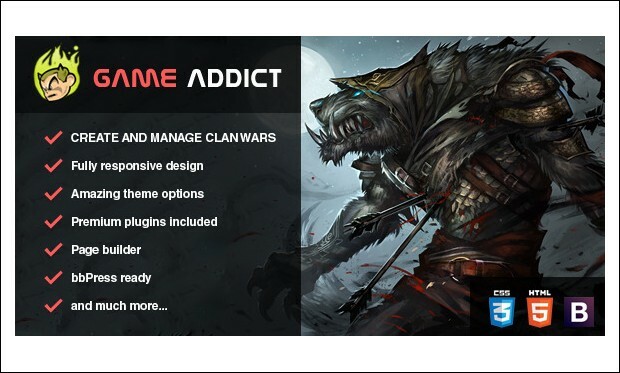 Game Addict is an attractive WordPress theme designed for gamers who like to build their own gaming website. Download this theme that comes at an affordable price and easily create and manage clan wars. Design your site by choosing from unlimited colours and background options. 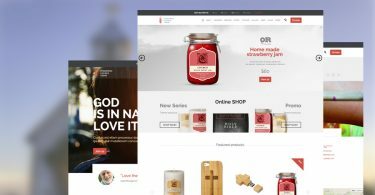 This theme is bbPress compatible and WooCommerce ready to improve the overall functionality of the website. 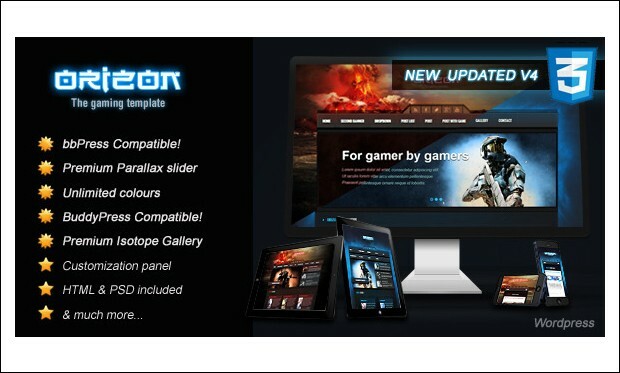 Orizon is an attractive gaming WordPress template suitable for building gaming, news and entertainment related websites. It is built using the modern CSS3 techniques to give your site a clean and shiny look. It supports BuddyPress and bbPress plugins. If you encounter any issue with the theme, then make use of the detailed instructions with video tutorials. 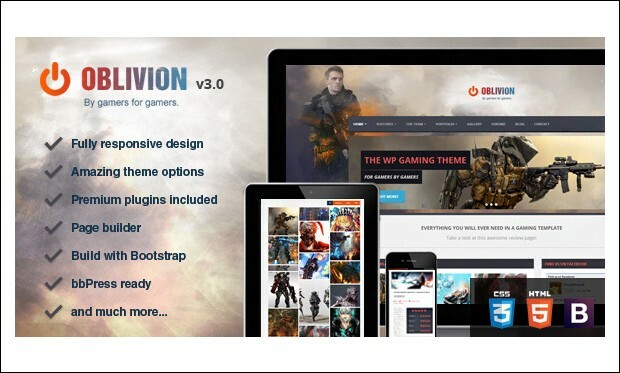 Oblivion is an ultimate gaming WordPress theme from Theme Forest. This theme is developed using the latest HTML5 and CSS3 techniques. Visitors can rate your posts by using star rating system. You can build multiple pages by simply dragging and dropping the controls via powerful page builder. 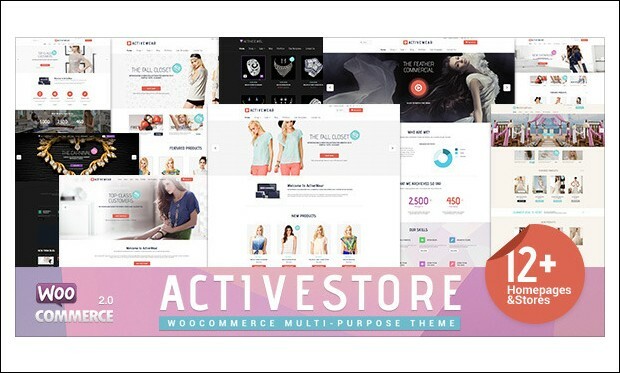 Start creating your own shop as this theme is WooCommerce ready. 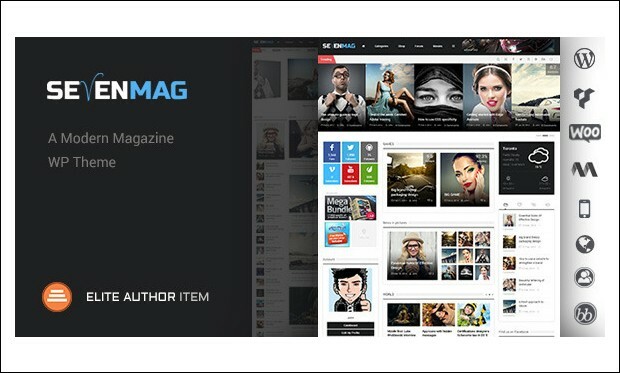 SevenMag is a flat designed WordPress theme well suited for creating gaming, news or magazine websites. This modern theme is compatible with the modern version of WordPress. It is built on the 12 columns T20 grid system and enables you to turn on or off the responsive mode of this theme. By using great Optiontree admin panel, you can customize the theme to suit your needs. 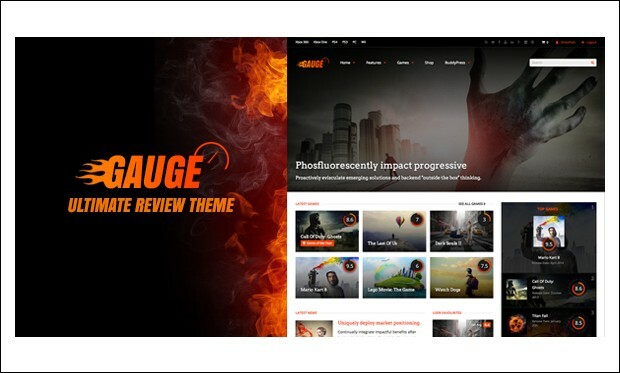 Gauge is a modern review WordPress theme that comes loaded with powerful features for easy creation and customization of the site. This theme is suitable to add reviews for games, movies, food and other similar kind of websites. You can build amazing page layouts by using layout builder within a matter of few minutes. The content gets loaded without page reloading by title, comments, date, awards and ratings. It’s a flexible magazine styled WordPress theme with a responsive design that automatically resizes on the browser of different screen sizes. Give your site a unique look and feel by selecting from 6 premade skins or create your own skin to match your style. This theme comes with a powerful rating system that helps you setup your own custom rating scale. 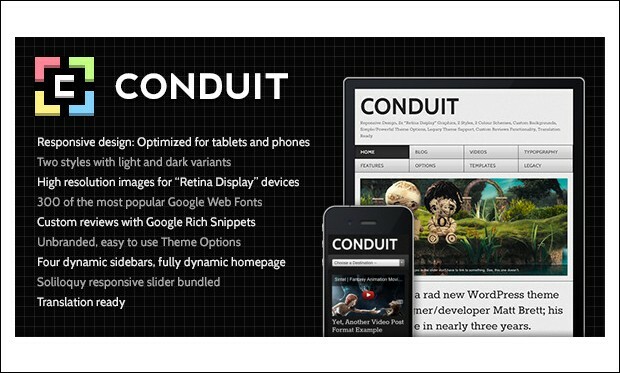 Conduit WordPress theme is suitable for building video game websites. This responsive and retina ready theme is optimized for tablets and mobile devices to make your site look elegant on them. It features built-in ad management of 728×90 leaderboard, 300×250 bigbox and four 125×125 buttons. The theme is compatible with popular browsers like Chrome, Firefox, Safari, IE8, IE9, IE10 and IE11. It is translation ready. 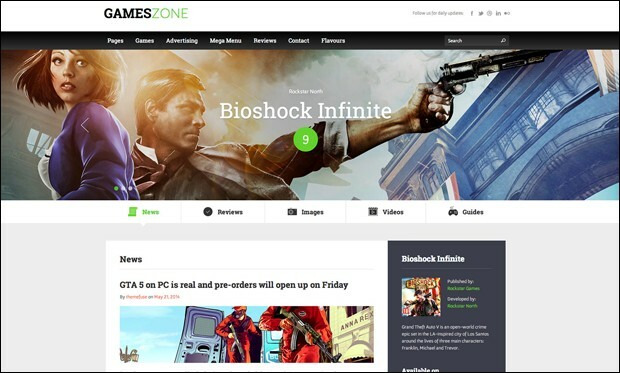 Gazette Magazine is a community WordPress theme designed keeping in mind the needs of those who wish to create gaming, portal, magazine and news websites. It is built with SEO in mind for improving your website ranking. This minimalistic theme is Ajax powered and features white label intuitive admin panel to help users with proper customization of the site. It supports bbPress and BuddyPress plugins. 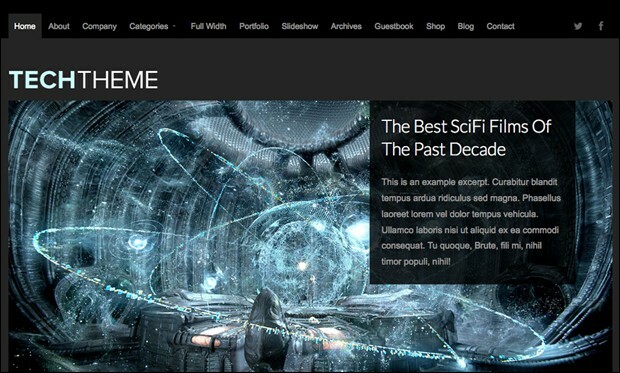 Made is a feature-rich WordPress theme perfectly designed for crafting video game websites. 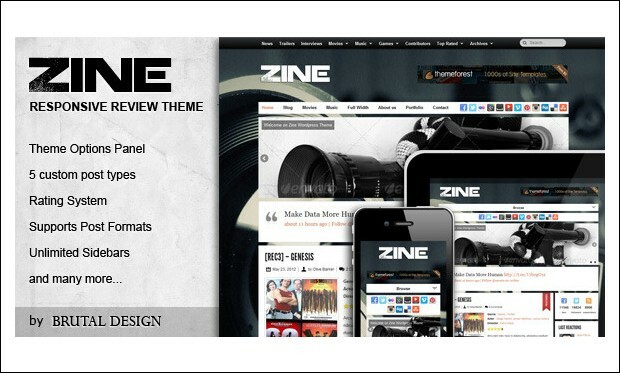 This theme is also suitable for creating movies, music, fashion trends, clothing and comic sites. Download this theme that comes at an affordable price and design your site the way you want to. 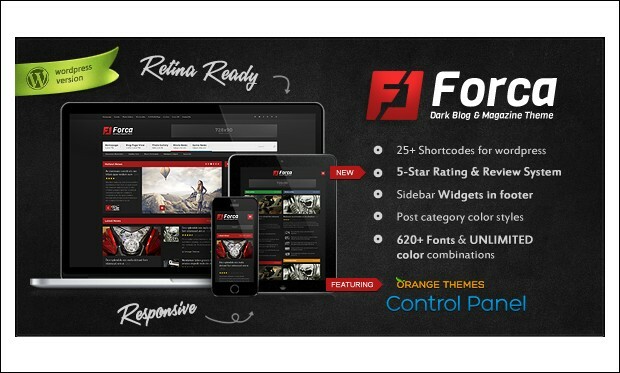 Visitors can rate your reviews in the form of stars from 0 to 5, percentages between 0 to 100, numbers between 1 to 10 and letter grades from A+ to F.
Forca is a responsive and retina display ready WordPress theme suitable for creating gaming, gadget, sports and cars websites. By using orange themes page builder, you can visually drag and drop the interface to create unique page layouts. 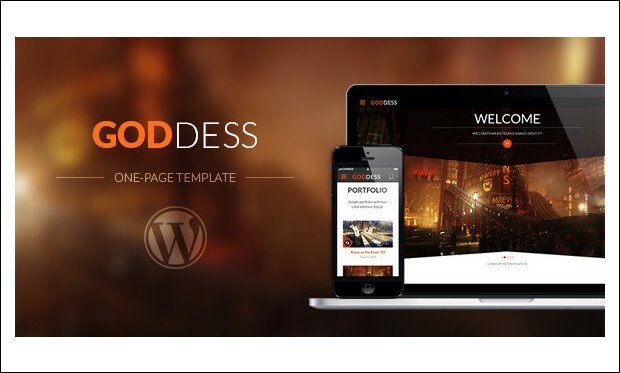 This theme is BuddyPress ready and WooCommerce ready. It includes contact form template to help visitors send queries or feedback privately to the website owners. 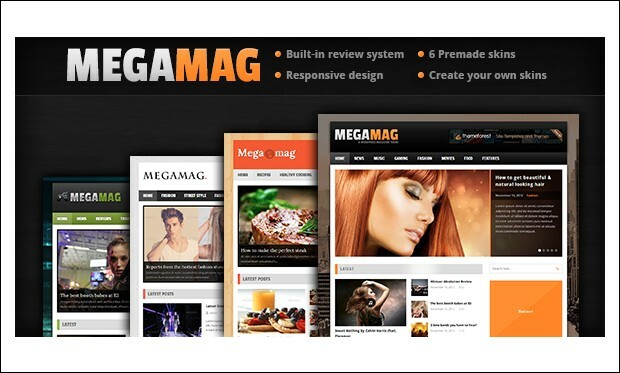 It’s an elegant and eye-catchy WordPress theme designed to grab visitor’s attention towards the website. This theme includes 5 custom post types such as video game reviews, movie reviews, music reviews, book reviews and portfolio. Zine theme is built on the BrutalDesign framework and allows you to setup meta tags for every post and page. It includes .po and .mo files for easy translation of the website. 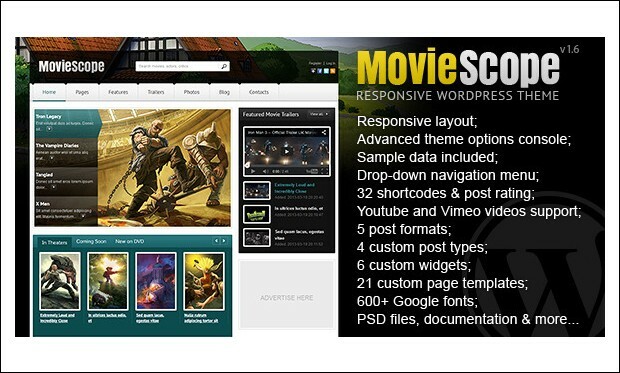 MovieScope is coded with HTML5 and CSS3 techniques and would be a great choice for building game, tech, fashion and music sites. It comes with five different custom post formats namely standard, image, video, link and quote. You can make use of the theme’s online documentation while customizing and installing the theme. This theme lets you embed YouTube and Vimeo videos in your posts. 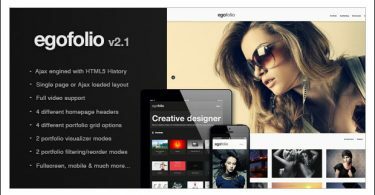 Artikulo is a bold magazine WordPress theme that comes packed with simple and easy to use features. It includes review and rating system to help you write reviews for games, music, products, video etc. You can build unique page layouts by dragging and dropping the interface via powerful page builder. This fully responsive theme looks and works great on desktop, laptop, iPhone, iPad, android and smartphones. This is a beautiful multipurpose WordPress theme with one page layout. 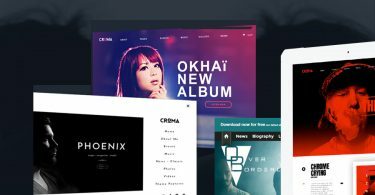 Download this theme that comes at $38 and start building your own site in a professional way. Design your site by choosing from unlimited colour schemes, 500+ Google fonts and 700+ font awesome icons. If you encounter any issue with the theme then follow the step by step instructions listed in the documentation. 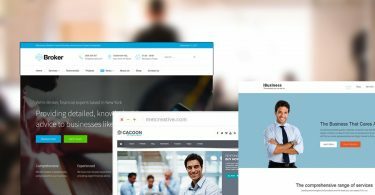 It’s a WooCommerce enabled WordPress theme that is built on the bootstrap 3 framework and coded with HTML5 and CSS3 techniques. This theme is highly customizable to match your needs. Important features are cloud zoom ready, one page custom checkout, 30 shortcodes, products colours filters, product countdown and many more. You can build stunning slides by using amazing revolution slider. 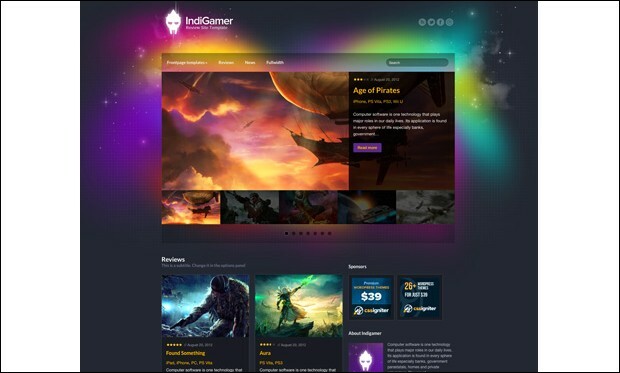 IndiGamer is a responsive WordPress theme mainly designed for those who wish to create gaming reviews website. It features powerful review system to help users enter the score. This theme is built with WordPress best practices to ensure future web compatibility. You can showcase top rated reviews on the sidebar of the web page by using the built-in custom widget. It’s a fresh and bright coloured gaming WordPress theme from Theme Fuse. Games Zone theme is highly customizable and allows you to change backgrounds, colours and other elements of the theme within few clicks. Due to its responsive and retina ready design, the theme looks sharp and crisp on a wide range of devices. You can import the XML demo content in one click. 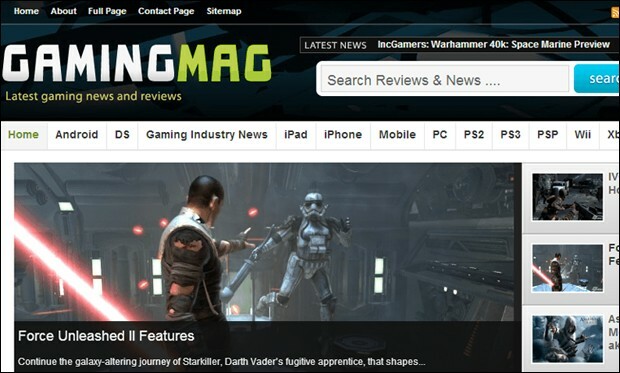 It’s a minimalistic designed WordPress theme for creating gaming magazine, gaming blogs and gaming portal websites. You can have full control over the website with the help of powerful theme options panel. GamingMag theme is localized for translating the theme to other languages. This theme lets you integrate social media profiles in your site. It is adsense ready and cross browser compatible. 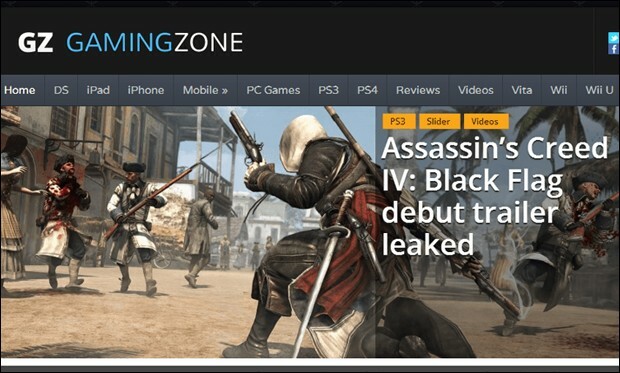 GamingZone is another best magazine WordPress theme suitable for building gaming portals, gaming news and general news sites. You can easily upload your own logo and setup drag and drop menus from the admin area. The customer support team offers unparalleled assistance to solve your issues and helps you get started with your own site in no time. Tech is a gorgeous WordPress theme perfectly designed for creating gadget, app, gaming or gizmo websites. It is coded with HTML5 and CSS3 technologies and built on the top of options framework. The responsive framework of this theme looks and works amazing on devices of diverse screen resolutions. This theme is compatible with WooCommerce plugin for selling products online. 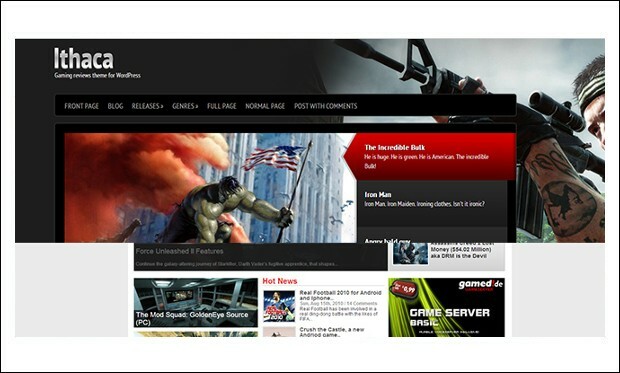 It’s a stunning WordPress theme designed for building gaming websites. You can add social media buttons onto posts and web pages to allow visitors to share important information over the social networking platform. You can design your site by selecting from 6 built-in colour styles or add your own style. This theme supports WPML plugin to help you build a multilingual website. It’s a mind blowing WordPress theme especially designed for creating game portal websites. This theme has been designed using News Show Pro and Tabs plugins. You can display articles by category, publication and date to match your requirement. With its responsive design, the theme looks beautiful on every screen size from large desktop computer to small mobile devices. This elegant theme is based on SMT framework 2.0 and comes packed with some powerful features to help you with easy creation and customization of the website. GameZone theme is search engine optimized to allow Google, Bing or Yahoo to quickly crawl and index the web pages. It features anti spam to protect your site without any need to scrutinize captcha. It supports Ecwid and WooCommerce integration into the site. 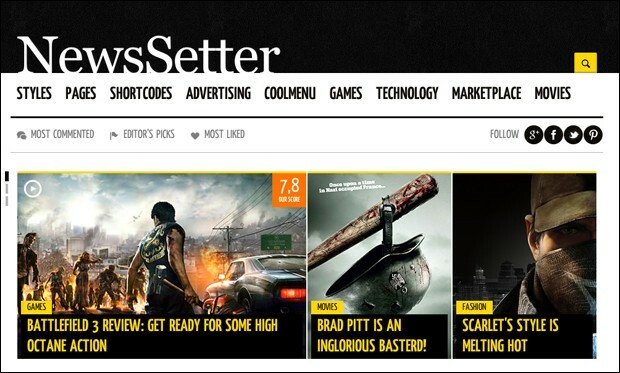 News Setter is a smart and gorgeous looking WordPress theme designed for creating gaming magazine, blog or technology websites. 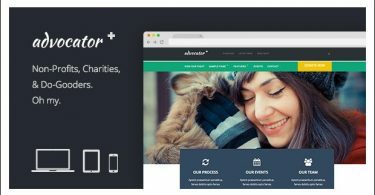 Give your site a unique look and feel by using premade styles of black, blue, red and green. It features HTML5 animated slider for creating stunning slides within few minutes. This theme includes built-in page layouts like about us, blog, contact, review and so on. It’s a beautiful WordPress theme that comes loaded with user friendly options to help you with easy customization of the website. Grab your visitor’s attention with its featured posts slider. GameFusion theme features uncompressed and organized code to ensure future web compatibility. This theme is SEO optimized for enabling search engines to crawl and index the site to improve its ranking. It is WooCommerce ready and localization ready. 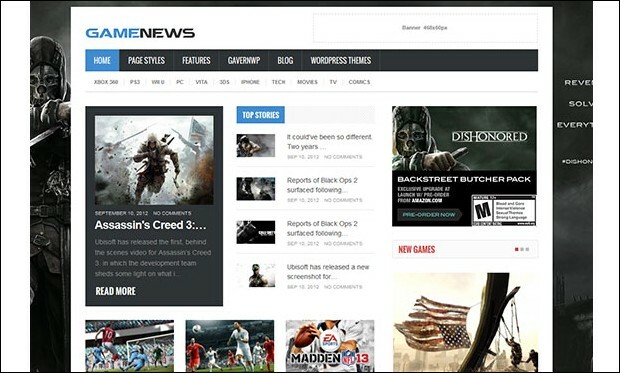 As the name suggests, this theme would be an ideal solution for creating games news website. It features responsive layout to enhance the appearance of the site on desktop, laptop, smartphones, tablets and mobile devices. 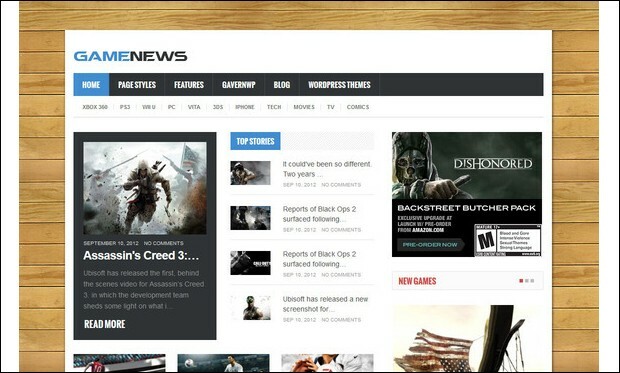 Game News theme supports social network with social API. Key features are typography shortcodes, 7 page templates, 3 built-in colour styles, auto-sized post thumbnails and 3 widgets. 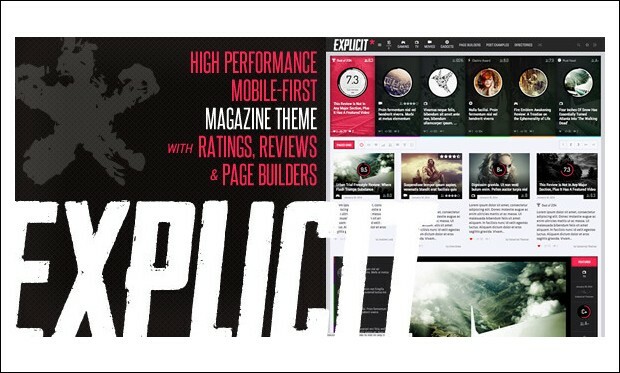 Explicit is an attractive WordPress theme designed for creating gaming review or magazine websites. 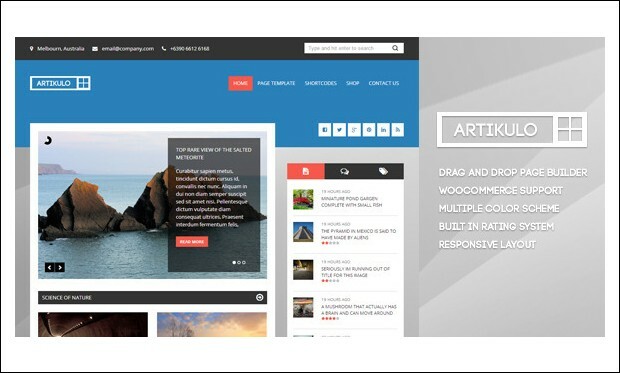 This Ajax powered theme is compatible with BuddyPress and WooCommerce plugins. 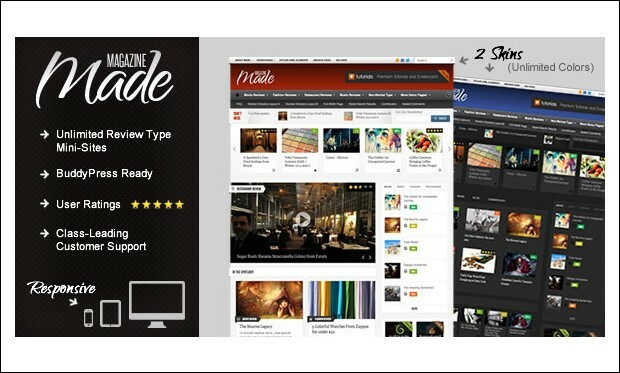 It features review or rating system, social counts, custom sidebars, custom menus, featured videos etc. You can easily import the demo content in few clicks. It is localized and translatable to other languages. 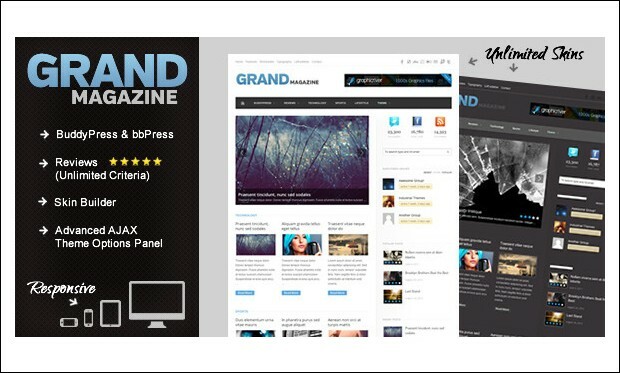 GrandMag is a clean and elegant BuddyPress and bbPress WordPress theme from Theme Forest. It comes with powerful review system with 6 colours, 3 rating image options and unlimited rating criteria. By using skin builder, you can build unlimited skin designs for your website without touching even a single line of code. You can embed videos and multimedia into the website. 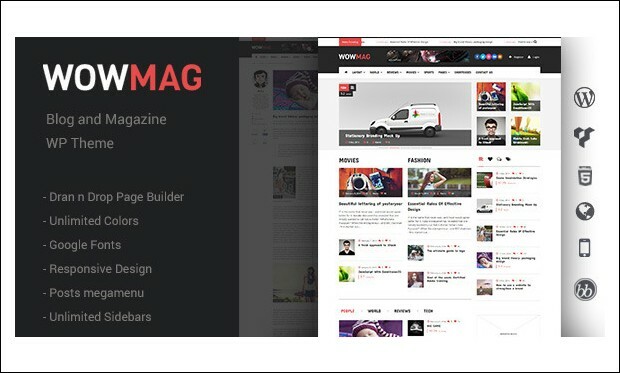 WowMag is a fully responsive theme that is compatible with the latest version of WordPress. You can build multiple page layouts by simply dragging and dropping the controls via visual composer. It is built on Bootstrap framework with 12 columns system. Visitors can rate review through star, point or percentage review system. It is well documented to solve your potential queries related to the theme.